Have a job to offer? 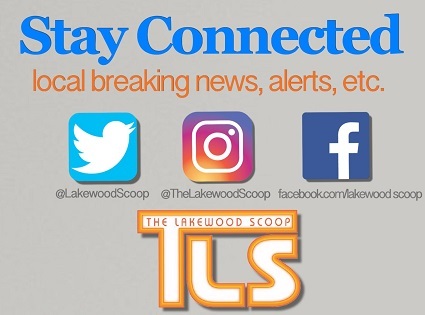 List it free by sending it to LakewoodNJJobs@gmail.com (280-character limit).To receive all job offers, find handle @LakewoodNJJobs on Twitter, or text ‘follow LakewoodNJJobs’ to the number 40404 to receive alerts via text message. This is a free public service. 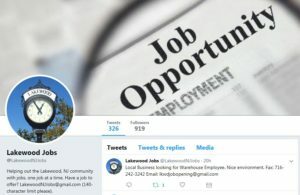 There are 17 Comments to "@LakewoodNJJobs: Lakewood’s free job listing source; Hundreds of successful matches to date"
My husband is looking for a job in the kashrus field. 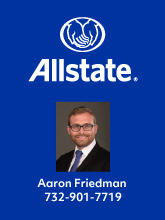 He has experience as a mashgiach. If anyone has any leads or knows whom to contact to help him with his job search please post. TY and tizku l’mitzvos! Did you reach out to the KCL, or any of the Kashrus Org? Palvinder… Are you looking for a teacher/rebbi? Is it tutoring? secretary position in a school, part-time . Looking to join a play group as a moras assistant for after suckos. I havre many years experience. Looking to join a play group as a morah or morah’s assistant for after suckos. I have many years experience. I highly recommend this Twitter handle as a way to find a job. I’ve been looking for a job for quite a while…and b’h was finally able to find one through a similar advertising idea. I’ve spoken with most local Recruiters and found that most of them deal with entry level employees. They won’t say this directly, obviously, but that their main focus. They deal mainly with post seminary girls, were job finding is easy and simple. Most of them are very hard to get through too, after the initial meeting. Another very important point… In a very unfortunate situation many big local companies are under contract with these agencies, not too help their employees find another job. I’ve tested this myself and was shocked too see with my own eyes. After calling 2 agencies and saying I work in so in so place( a famous local big office) they said we can’t speak to you, we’re under contact from your current employer. Express Recruting was one of them can’t remember the other. Other recruiterers hinted the same. Feel free to test this yourself. Following this Twitter handle and looking through local listings is the most effective in from my long experience with job searching. Also have in mind if your thinking of joining a big powerhouse company, you might be subject to under the table deals that will it harder for you to leave. You will basically be blacked out by recruiting companies under these “deals”. Hope this was helpful to you,Hatzlacha rabba! Which twitter handle? @LakewoodNJJobs ? Does anyone know if there are any people looking for cleaning help in schools? Desperately looking for a part time job where I can work from home. I have great writing skills, am proficient in excel, quick books, word press, and other areas. Please post if you know of anything. Thanks. Look in the bp weekly. I think its beautiful thatcTLS hosts this forum but I dont understand why people post they’re looking for a job with out posting their contact info. Let’s say I wanted to hire the Kashrus guy, the playgroup sub or the expert writer, how can I reach anyvof you ? What, I should post my contact info and then you call me ? And I should get 50 calls ? I dont think so.